Grab the attention of your audience right away with a notification bar on your landing page. Notification bars are a dismissible section at the top of your landing page. Use this space to highlight important messages you want to send to your audience. 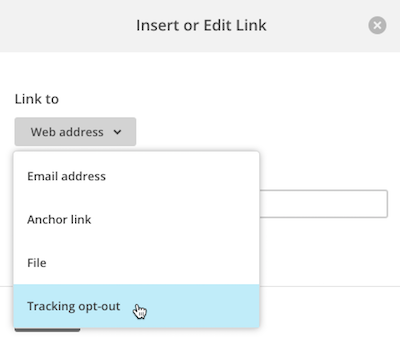 If you’re using tracking tools on your landing page you can add a link to the notification bar where page visitors who do not want to be tracked to can opt-out of Track with Mailchimp. 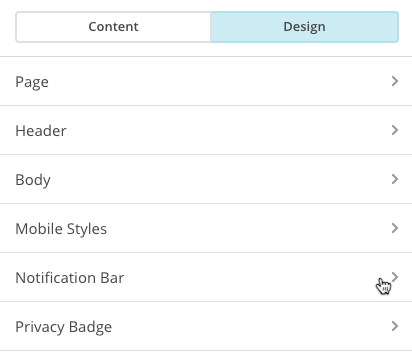 In this article, you’ll learn how to turn on and style a notification bar on a landing page. The notification bar sticks to the top of your landing page as visitors scroll. 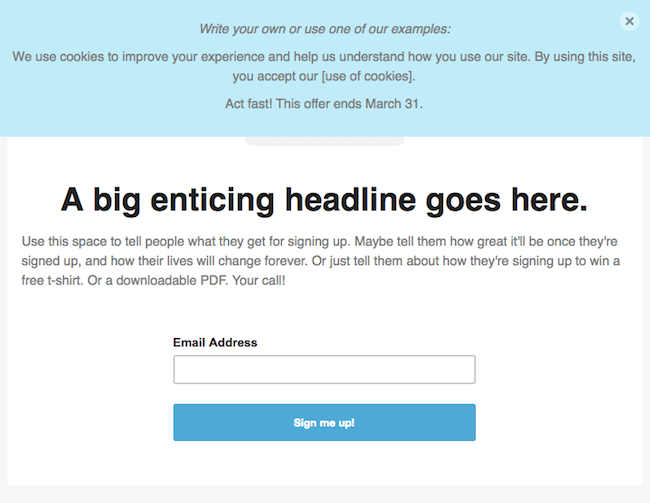 The bar is dismissible, so when people who view your landing page dismiss the bar, they won’t see it again. The bar isn’t enabled by default, so you’ll need to turn it on to use it. If you want to use the bar on multiple landing pages, turn it on and add your design separately for each page. After you create a landing page, you’ll add the notification bar to your draft. You can also add and edit the notification bar on a published landing page at any time. To turn on the notification bar, add your message, and set styles, follow these steps. Navigate to the Campaigns page and click the name of the landing page you want to work with. In the editor, click the Design tab. Toggle the Notification Bar to turn it on. 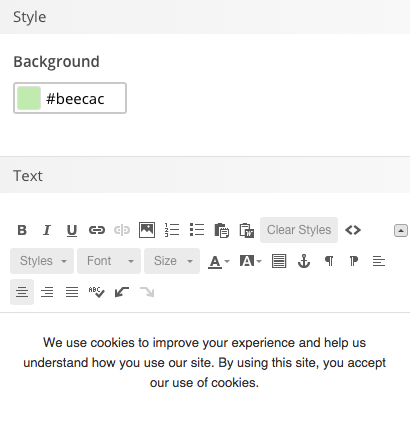 In the Style section, click to choose a background color. 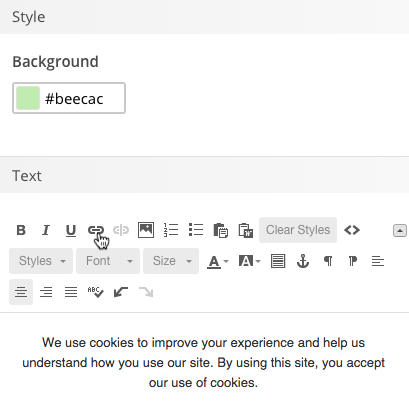 In the Text section, add your message and use the tools to set styles. When you’re finished editing, click Save. If you’ve added Track with Mailchimp to your landing page, you can use a tracking opt-out link in your notification bar. 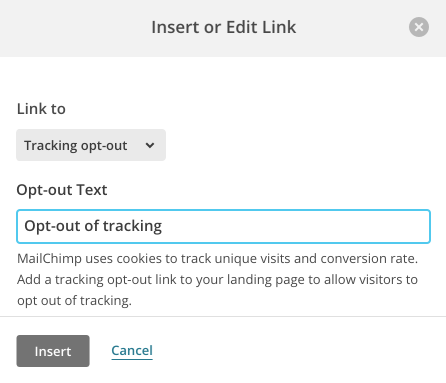 People who visit your page and do not want to be tracked can click the link to opt-out of Track with Mailchimp. After a visitor clicks the link, we’ll show a confirmation message. To learn more about how page visitors can opt-out of tracking, take a look at our articles about Facebook Pixel or Google Analytics tracking. To insert a tracking opt-out link to your your notification bar, follow these steps. In the Text section, click the Link icon. Click the Link to drop-down and select Tracking opt-out. In the Opt-out Text field, write some text for the link. That’s it! People who view the notification bar on your published landing page will see the tracking opt-out link. Learn how to promote your published landing page.